When you live around beauty, take your camera. This picture is all about being at the right place at the right time. We were in the car driving back from Kevin's office where I helped him with the removal of a dishwasher. He has this habit of driving home by way of A1A which gets me twitchy until I finally relax. I'll admit it, I'm a much better driver than I am a passenger. I will change your radio station, reset the seat for my liking, and generally just want to "be there, already". Backseat Driver's anonymous? Charter Member right here. I learned that while driving around in town to bring a camera. I put a lot of pictures on this blog as a result and a picture may be worth 1000 words, but it also helps bring back the memories. We were stuck in traffic, mid afternoon on last Sunday, January 9th, 2011. It was as you can see brilliantly sunny. My family up North were suffering through another snowstorm and I was comfy in the car. We get our bad weather, I'll be finishing up Hurricane Prep Food for another month before we start buying more. The trip up A1A was bumper to bumper but the scenery really did make up for it. While the snow was falling in Philly, the traffic was slow in Fort Lauderdale. 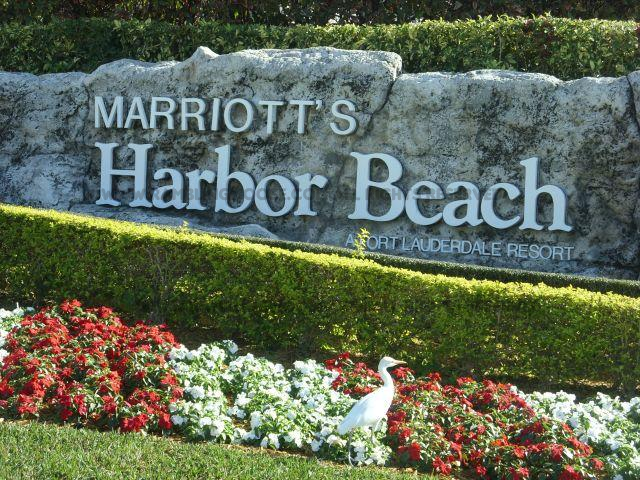 Just as we pulled up to the Marriott's Harbor Beach Resort on the beach at a stop light, I turned and saw this Egret. Timing was perfect, so I ran down the window and fired off a couple shots. I've got a good 20 pictures of my sitting in the car through the sun roof, pointing at the beach and the surf, but this one was asking to be posted today. The Harbor Beach is a fascinating building. Its multiple story facade is built to look like a cruise ship that has beached on the shore. There was a discussion of demolition and thanks to some negotiations, it got bought and upgraded. If you want to stay at a one of a kind hotel, this one is a good choice. 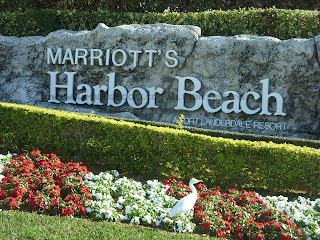 It really is right on the beach. If you do stay there, say hello to my little friend. He may even be out front by the sign.